Highlights: Experience a must-see world-class show featuring the Shanghai Acrobatics School & Troupe before going off to tour the city and catch a magical view of Shanghai at night. Our evening begins by attending a must-see performance by the award winning Shanghai Acrobatics School & Troupe. 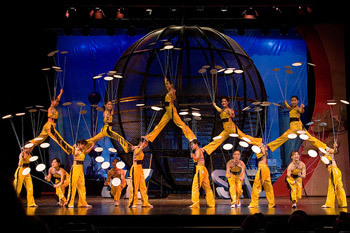 Witness incredible feats of skill and gracein this world-class acrobatics show. Afterward, you will travel by coach to catch a magical view of Shanghai at night where we will see Peoples Square, the city lights along the Bund, and the French Concession District. Finally, we stop at Xin Tian Di, a chic restaurant, pub and boutique area where you can spend time on your own or continue back to your hotel with the group.